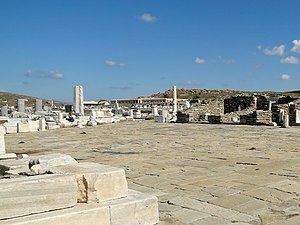 An auncient agora in Delos, Greece. Ane o the public spaces efter that the condeetion is named. Agoraphobia is an anxeeity disorder chairacterised bi symptoms o anxeeity in situations whaur the person perceives the environment tae be unsauf wi na easy wey tae get awey. Thir situations can include appen spaces, public transit, shoppin maws, or semply bein ootside the hame. Bein in these situations mey result in a panic attack. ↑ 2.0 2.1 "Agoraphobia". PubMed Health. Retrieved 11 August 2016. ↑ Wyatt, Richard Jed; Chew, Robert H. (2008). Wyatt's Practical Psychiatric Practice: Forms and Protocols for Clinical Use (in Inglis). American Psychiatric Pub. pp. 90–91. ISBN 9781585626878. Archived frae the oreeginal on 2016-08-21. This page wis last eeditit on 12 Februar 2018, at 18:48.